Yesterday after many years of delay, the FDA finally approved Afrezza, a new inhaled insulin. I have been following news about this insulin for a while as quite a few of the claims made for it were very exciting, most notably that it is an ultra-fast insulin that reaches the bloodstream within 15 minutes. If this was true, that would make it capable of replacing first phase insulin, something that would revolutionize our ability to control blood sugars. It was also said that unlike Exubera, the inhalable insulin that was approved in 2006 and taken off the market a year later, the many years of testing the FDA insisted on for Afrezza has shown that it does not harm the lungs. Also, from a cosmetic standpoint, unlike the case with Exubera's inhaler, the Afrezza inhaler is a small, whistle-like object easily carried in the pocket and discreetly used. Even setting aside the improved activity curve of Afrezza, an inhalable insulin that worked just as well as the injected insulins would have the advantage of appealing to the huge number of people with Type 2 whose fear of needles causes them to put off using insulin until long after it would have made any difference in their health. It would also be wonderful if children with diabetes did not have to inject themselves. Though the needle phobia angle has been overemphasized as a benefit of Afrezza. Those of us who have injected insulin have found that it is not the big, scary deal non-insulin users assume it is. The needles, when prescribed in the right size and ultra thin gauge are painless. (If yours aren't you talk to your doctor about why you aren't using the ultra thin needles and the shortest needle compatible with your level of body fat.) So if we have gotten injected insulin working properly, the only reason we would want to switch to Afrezza would be if it was not only easy to administer, but as effective as the insulin we have been using. So how good is this stuff? On first glance, the label that contains the Prescribing Information (PI) for Afrezza is disappointing on several points. But careful reading of the PI, and some knowledge of the history of this drug may counterbalance some, though not all of the issues the PI raises. According to the PI, while Afrezza does reach the bloodstream within 15 minutes, it does not become active until about 53 minutes after it is taken. This is very similar to the currently injected insulins, and at first, the graph shown in the PI made me question whether it truly is an ultra fast insulin. However, where it differs is the speed with which it stops acting. Where Humalog (or Novolog) don't start working for about the same 53 minutes, once they start working, their concentration in the bloodstream rises for another hour and then only gradually drifts back down, taking 4.5 hours to reach the level that Afrezza reaches in 2.5 hours. This means that Afrezza is much less likely to produce hypos or the hunger that near hypos can cause. You can see the curve for the activity of Afrezza compared to Humalog in chart A and the concentration in the blood of Chart B below. Take a look at it. We will be discussing it further later on. The second thing I noted when I read the PI was that Afrezza is only available in limted dose sizes all of which are at strengths which are equivalent to multiples of 4 units of Humalog. The avialable doses are 4, 8, 12, 16, 20, and 24 untis. Seeing this, I thought. Damn! Four units of insulin is a LOT of insulin for someone who is insulin sensitive. This means the only Type 1s who can use this are those slurping down large non-diet Cokes with each meal. And of course, with such limited dose choices, there is no way to match this stuff to your carb intake, which is the proper way to use fast-acting insulin. However, after some thought, and after looking at the activity curve again I had a flash of insight. With that much, much shorter activity curve, and with the way that the insulin peaks very fast 1 hour after eating--which is when the bulk of the carbs from your food hit your bloodstream, it looks like you could use a much larger dose of Afrezza, get a much more powerful surge of insulin just as you got that high from the food, and then, because it drops so fast, clean up the bit of food left at two hours, and be done with your insulin without the hypo problems that the much bigger dose of insulin would cause if it were the much slower to peak and much slower to exit injected insulin. So with that in mind, it struck me that the 4 unit equivalent might very well be suitable for someone insulin sensitive who usually uses 2 units to cover a meal. I would love to get my hands on this stuff to give it a try, though because of the dose equivalence and my insulin sensitivity, I would have to test it against a big bowl of Pad Thai (2 OGTTs in one bowl!) . However, that isn't likely to happen. But if you do end up being able to try a sample, I'd love it if you could send me a graph of your blood sugars after using it and a comparison to how you do with an injected insuiln at the same carb intake. With data like that perhaps we can start putting together some useful information about how this stuff really works when used by people who understand how to use insulin. These patients started out with mean fasting blood sugars of 175.9 mg/dl and ended up with mean fasting blood sugars of 164.7 mg/dl. Why? Because the idiots who treat these patients had them on oral drugs only, and gve them no basal insulin, which looking at those fasting blood sugars they needed very badly. My guess is that these patients were not given much help in learning how to use this insulin in a way that bore some relationship to the carbs they were eating. If they were just told to take the same dose at every meal, the chances were it was too small a dose to do much to control their blood sugars after meals. The lack of any graphs showing these patients' blood sugars after meals is telling. So my conclusion from all this is that we have no data here that tells us how Afrezza would perform if it were used properly--with a basal insulin--and dosed to have some kind of relationship to the person's carb intake. But at the same time, my conclusion is that this is probably how the PCPs who treat so many people with Type 2 diabetes would dose Afrezza. So it probably gives us a good idea of how well it will work in the real world--which is not as well as injected insulin, based on other charts provided in the PI. 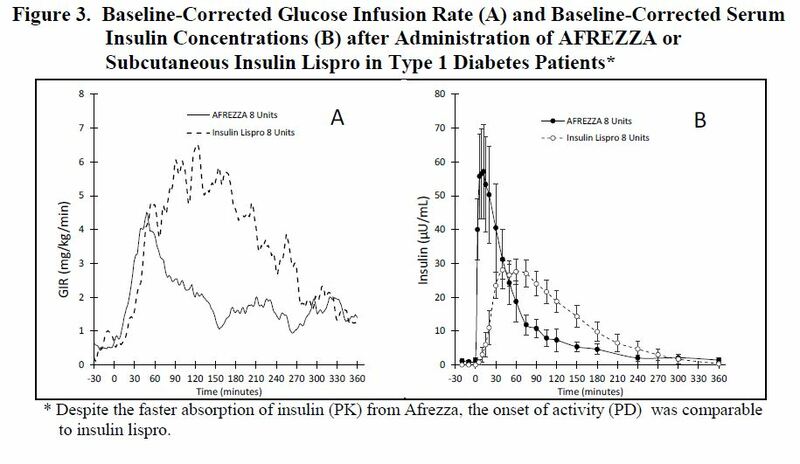 But the problem here isn't with Afrezza, but with the fact that injected insulin, because it lasts for up to 5.5 hours, is also providing quite a bit of basal coverage for these people with the extremely high blood sugars. If endocrinologists are able to prescribe basal insulins in appropriate doses along with Afrezza, and use Afrezza strictly to cover meals, it might show much better results. But if busy doctors just prescribe generic doses of Afrezza too low to cover meals, along with two or three ineffective oral drugs and no basal insulin, Afrezza may end up looking like a failed drug, and the lesson patients may get is "insulin doesn't work." I hope that doesn't happen. The main side effect of Afrezza is cough, which is called "bronchiospasm" which is an intense cough. The data presented to the FDA before approval suggests that most patients cough a little bit when they start this stuff and then it calms down some. The more severe bronchiospasm generally occurs in people with underlying lung disease or asthma. There may also be a slight decrease in the amount of breath the person can draw into their lungs when they inhale their insulin. This was not enough to concern the pulmonary specialist on the panel that recommended the FDA approve the drug. The data suggest that any decrease in lung capacity is reversible if the person stops the drug. But because of this side effect, people with asthma, smokers, and people who have recently stopped smoking should not use Afrezza. The PI also says that doctors should test patients' breath capacity (spirometry) before prescribing Afrezza and then check it some months later, just to make sure they aren't having a significant problem. The only other major side effect mentioned is that this stuff appears to interact badly with Actos and Avandia and raise the risk of heart failure. This isn't surprising, as ALL insulins when taken with these drugs raise the likelihood that people will develop heart failure. If you read the pages on the main Blood Sugar 101 web site about these drugs, you will see that there are plenty of other reasons you shouldn't be taking them. There is no contraindication for taking Afrezza with other oral drugs. I would suggest that you take it and any other insulin only with metformin. You can read of the problems with the other oral drugs on the main Blood Sugar 101 web site. I think it would be very wise NOT to use Afrezza with Januvia since these drugs may turn off a part of the immune system that kills newly cancerous cells. Though testing suggests that Afrezza does not raise the risk of cancer, why take chances by turning off your body's first line defense against rogue cells? Afrezza has not been tested in children and is not currently approved for use in children. The FDA has requested that tests in children be run with an eye to approving it for them in the future, but obviously before they could be performed, the company that makes Afrezza will have to come up with smaller dose sizes. There has been no testing of Afrezza in pregnant women, only some confusing tests in rodents, which came up with mixed findings that are hard to interpret. Prescribing it to pregnant women is not recommended in the PI, but not flat out prohibited. Pregnancy is not the time to experiment with new drugs. Obstetricians know how to use injected insulin to keep women with gestational diabetes healthy. If you are diagnosed with gestational diabetes, get over your needle phobia (it takes about three shots, max) and take the shots. Afrezza is prohibited for people with lung disease, asthma, smokers, and those who have recently stopped smoking. Now that It's Approved Can You Get a Prescription for Afrezza? Probably not. Though the drug has been approved, it is produced by a small company, MannKind Corp., which is largely owned by Alfred Mann, the man who originally developed the Minimed pump and subsequently sold to Medtronic. MannKind does not have the resources to market and distribute the drug. So while they do have a factory in Connecticut that is ramped up to produce several hundred thousand doses of Afrezza, they do not yet have a partnership agreement with a larger company that they would need to market and distribute this insulin. They have been telling the public that such a partnership will be announced "real soon now," but they have a history of saying this that goes back to the early 2000s. Until such a partnership is in place, it is going to be very hard to get your hands on Afrezza. And sadly, the fact is that Afrezza competes with one cash cows or another of all the big drug companies that do have sales forces that market to endocrinologists, may mean that MannKind will find it tough to find a partner who will not buy into Afrezza to bury it, to keep their other diabetes products selling strongly. They have been looking for a partnership for years, and the fact they don't have one now that the drug has been approved is worrisome. But it may also be a sign of caution on the par of Alfred Mann, the company's founder. He is in his late 80s, still sharp as a tack, a billionaire several times over, and someone who has made it crystal clear that his interest in his latter years is in improving the health of people with serious diseases, rather than just piling up more wealth. My guess is that such a man is not going to sign an agreement with a company that will not actively promote the drug and make sure it finds a market. But exactly how this will play out is not yet known. If a partner is announced, the next issue will be, will your insurer pay for Afrezza. Exubera was priced more expensively than injected insulin. MannKind's executives have said that Afrezza will be priced competitively with insulin pens. So if your insurer will pay for pens (which for years, mine would not) you might be able to get Afrezza to try out once the company finds a marketing and distribution partner. The many years of testing of this drug suggests it is safer than Exubera, whose problems quickly became apparent. However, if you are already using injected insulin and it is working for you, there is no need to rush into using it. If you are having trouble matching insulin to your meals and avoiding highs and hypos, and if can get some samples, it might be interesting to see how well it works for you, and test out the theory that it acts in a more physiological manner. But there is no need to rush. Let other people be the guinea pigs until it is clear how Afrezza really works and what the real risks are in using it. If you are a person with Type 2 diabetes whose doctor is telling you you really should try this stuff because your blood sugars are dangerously high, tell your doctor you would be happy to try it, but that you also want the long-acting basal insulin shots that will lower your fasting blood sugar and make Afrezza more effective. And if Afrezza doesn't give you normal blood sugars after meals, ask your doctor for injected insulin and read up on how to carefully adjust the doses until you can get the tight control that will prevent you from developing complications. Is Afrezza Suitable for Newly Diagnosed Type 2s? The one place Afrezza might be a real game changer would be in the case of the newly diagnosed people with early Type 2 diabetes, who are usually just put on oral drugs. That is because of the data that suggests that starting insulin very early in the treatment of diabetes can produce very good results years later, even after insulin has been discontinued. But if you are newly diagnosed, before you grab your insulin inhaler, try the strategy you will find described HERE. It may lower your blood sugar enough that you don't need Afrezza. Even if you do end up trying insulin, using that insulin with a lower carbohydrate intake is likely to give you much better blood sugars, both fasting and post-meal, than using meal-time insulin with a very high carb intake. Doing that is the classic case of keeping one foot on the accelerator and one on the brake.